About a month ago, I was introduced to a project called Dunnock through Acephale Winter Productions. I was asked to review their promo tape and was extremely pleased with what I heard. It is definitely not for everybody because of the sheer intensity of the music and the raw production but for those who did understand and enjoy it, the 4 track promo tape was an extremely rewarding listen that kept you wishing for more! Well, those wishes have been granted with Dunnocks most recent EP, The Rainy Season. Released through Sylvan Screams Analog, it is a terrifying release that is a bit easier to access than the promo tape, despite there being an even darker overtone on the music at hand. 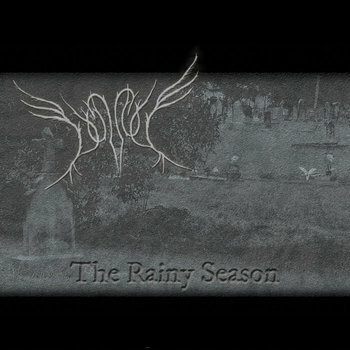 The Rainy Season starts out hard and heavy, instantly drawing forth the sounds from their previous material. Distorted and fuzzy guitars, menacing, reverb-laden screams and an overall dark atmosphere. Melody was used a bit more here than it was in previous releases but is pushed aside for the most part to let the vocals shine and show off their power. There are a few samples that are used sparingly to enhance the creepiness of the sound. They sound like old radio transmissions that are forever lost in a tangle of static, giving the tracks that harness these samples to have an apocalyptic vibe to them. The vocals are definitely the focal point here and while it is near impossible to distinguish what is actually being said, you can feel the emotions in them and within the track without knowing what the lyrics are. The passion within the vocals is easily heard and if you sit down and focus on the music, you really understand the meaning behind them. The guitar riffs are substantial and very big in The Rainy Season. There is a lot more depth to the sound and you can distinguish from one note to another, which is a change from past works. It is really nice because the sound has shifted a bit towards depressive black metal instead of drone. A lot of the drumming and guitars were improvised and some of the recordings were first take recordings, so this is as raw as one can get. That is very impressive considering all songs sound extremely well prepared and written! Dunnock is a project that has impressed me in the past and has once again impressed me now. I only look forward to what is coming next and hope that it is still this good! Maybe the next release will be fully improvised, even down to the vocals? Who knows, because with Dunnock, everything seems like a possibility!